work 2dc in next sc, yo pull through all loops. Coat - Worked in one piece, starting with yoke. Pattern Rows 2 to 4 - ch1, 1sc in base of ch1, 1sc in each st to end. Turn. Rpt Pattern Rows 1 to 4 three more times. Fasten off. Turn. Join in color 2 and rpt Pattern Row 1. Fasten off. Turn. Join in color 1 and rpt Pattern Rows 2 to 4. Fasten off. Turn. Join in color 3 and rpt Pattern Row 1. Fasten off. Turn. Join in color 1 and rpt Pattern Rows 2 to 4. Turn. Rpt Pattern Row 1. Fasten off. Row 2 - ch1, 1sc in base of ch1, 1sc in each sc to end, sl st to first sc on beginning of row. Turn. Rows 4 to 6 - ch1, 1sc in base of ch1, 1sc in each st to end, sl st to first sc on beginning of row. Turn. Rpt Rows 3 to 6 once. Fasten off. Turn. Row 11 - Join in color 2 and rpt Row 3. Fasten off. Turn. Row 12 to 14 - Join in color 1 and rpt Rows 4 to 6. Fasten off. Turn. Row 15 - Join in color 3 and rpt Row 3. Fasten off. Turn. Row 16 to 18 - Join in color 1 and rpt Rows 4 to 6. Turn. Row 19 - Rpt Row 3. Turn. Fasten off. Cuff - Rpt Row 2 working in dc2tog and sc's. Fasten off. Button/Buttonhole Bands - With RS facing, join color 1 to lower edge of right hand side of front edge, ch1, 1sc in base of ch1, work 37sc evenly in row ends up first front edge to corner, 3sc in corner, 1sc in each ch around neck to next corner, 3sc in corner, work 37sc evenly in row ends down second front edge to corner, 3sc in corner, 1sc in each st along bottom of coat to next corner, 1sc in corner, sl st to first sc on beginning of row. Turn. Button Band - ch1, 1sc in base of ch1, 1sc in each sc along bottom edge to corner, 3sc in corner, 1sc in each sc along to neck edge. Turn. Starting with ch1, 1sc in base of ch1, work 1sc in each sc to end. Turn. Rpt last row twice. Fasten off. Buttonhole Band - Return to first front edge and join color 1 to neck edge, working from neck edge downwards to corner, ch1, 1sc in base of ch1, 1sc in each sc to end. Turn. Buttonhole Row - ch1, 1sc in base of ch1, 1sc in each of next 2sc, * ch2, skip 1sc, 1sc in each of next 8sc, * rpt from * to * 3 more times, ch2, skip 1sc, 1sc in last sc. Turn. Starting with ch1, 1sc in base of ch1, work 1sc in each ch2 space and sc to end. Turn. Starting with ch1, 1sc in base of ch1, work 1sc in each sc to end. Fasten off. Finishing - Close small gap under arms, weave in any loose ends of yarn, attach buttons to correspond with buttonholes. Row Two - Working in back loop of stitch from now on, ch2, 1dc in base of ch2, 1dc in each dc to end, sl st to top of first dc on beginning of row. Turn. Rpt Row Two twice. Fasten off. Rpt Row Two alternating colors 2 and 3 every four rows until 16 rows have been worked or work measures approx 6.5 Inches from beginning. Turn. Rpt Row Two alternating colors 2 and 3 every four rows until 16 rows have been worked from division. Turn. Fasten off. Working through both loops of stitch join in color 2 and starting with ch1, 1sc in base of ch1, work two rows in sc. Fasten off. Second Leg - Return to un-worked 46dc at division, join color 2 to next dc, ch2, 1dc in base of ch2, continue in the same way as first leg. Waist Band - With color 2, RS of work facing, starting with ch1 and 1sc in base of ch1, work 92sc evenly along cast on edge at waist to end, sl st to first sc on beginning of row. Turn. Rpt last row by working 1sc in each sc to end and sl st to first sc on beginning of row. Fasten off. Chain Tie - With 4.00mm hook and using color 1, ch130. Fasten off. Finishing - Close small gap on crotch, weave in any loose ends of yarn and trim. Thread chain tie through alternate dc's on waist, make 2 small pom-poms in color 1, Clover Pom Pom maker size 25 and attach to each end of each tie. Next Row - Working in back loop of stitch ch2, 1dc in base of ch2, 1dc in each dc to end, sl st to first dc on beginning of row. Turn. Rpt last row until 13 rows have been worked or work measures approx 5.5 Inches. Turn. Brim - Working in back loop of stitch ch1, 1sc in base of ch1, 1sc in each dc to end, sl st to first sc on beginning of row. Turn. Second Row - Working through both loops from now on ch1, 1sc in base of ch1, 1sc in each sc to end, sl st to first sc on beginning of row. Turn. Rpt Second Row once. Fasten off. Fourth Row - Join in color 3, ch1, 1sc in base of ch1, * dc2tog in next sc, 1sc in next sc, * rpt from * to * to last sc, dc2tog in sc, sl st to first sc on beginning of row. Fasten off. Turn. Fifth to Seventh Rows - Join in color 1 and ch1, 1sc in base of ch1, 1sc in each st to end, sl st to first sc on beginning of row. Fasten off. Turn. Eighth Row - Join in color 2, ch1, 1sc in base of ch1, * dc2tog in next sc, 1sc in next sc, * rpt from * to * to end, sl st to first sc on beginning of row. Fasten off. Turn. Join in color 1 and starting with ch1, 1sc in base of ch1, work 1sc in each st to end, sl st to first sc. Turn. Rpt last row once. Fasten off. Finishing - With WS facing centre sl st seam to back of hat, using 4.50mm hook sl st cast on edge (top of hat) together to close open gap. Weave in any loose ends of yarn and turn through to right side, fold brim onto front of hat, attach one Pom-Pom to each corner and secure tightly. 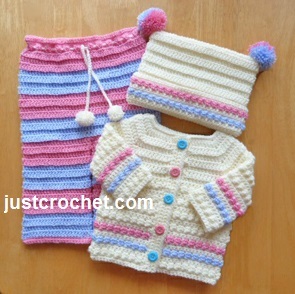 Hope you enjoy this free baby crochet pattern for a coat, pants and hat. on other websites or use any as your own.